Glenn Maxwell. Picture: Steve Riding. FOR US to get a score of 345 in the Royal London One-Day Cup at Worcester was a fantastic effort and Glenn Maxwell showed what he is all about. Glenn has shown good form in this competition. It has been a frustrating time for us all as we know how much talent he’s got, but previously in other formats, he had never really got going and given himself a chance, if you like. But the 50-over format probably suits him more than the 20-over stuff. He really showed what he can do with a match-winning contribution of 111 on Thursday. He gave himself a chance and because he has got every shot under the sun, he can take an attack apart if he gets in. That is what he did against Worcester; he gave himself a chance and then went through the gears. We want to prove people wrong in the one-day format. We have had a lot of people speak about our T20 form and want to put things right in the one-dayers and get to Lord’s. The score was the third highest one-day score in club history. We had been hitting scores before of 270 to 280, but when the pitch allows, you can get more. Pitches up north don’t allow that. Gary Ballance hit a good knock of 77 when we got almost 260 at the Oval on Wednesday and I was pleased for him as I thought he was a tad unlucky not to be given another Test. But he’s come back and looks like a weight has been lifted from his shoulders. 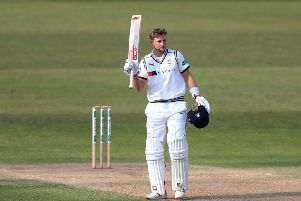 He looks like he has enjoyed his cricket this week and if he keeps his form up, he will be back in the England fold before we know it. A lot has been made of his technique in the Ashes. For me, I have spoken to him about it and his technique has not changed since the West Indies when he became one of the quickest England players ever to a 1,000 runs in Test cricket. He is one of those players who will always have his technique ripped to pieces as he is not quite easy on the eye and makes ugly runs. But for me, he needs to just keep doing what he has been. He’s one of those who when he gets in, scores a lot of runs and it’s about him getting back in form. Onto the Ashes series and who really knows where to put their money? It’s been bizarre.. I actually think that there’s nothing between the two teams really. Australia have been fragile at times, but they have a few key performers in there and when the likes of Steve Smith and Chris Rogers get in, they are capable of making big scores. It will be fascinating to see how it all pans out and I actually think it will go down at the end as one of the great series. There was talk about the pitch at Edgbaston and I thought it was very good. It looks very much like the pitch that we played on there a few weeks back. Whatever happened off the pitch, it did it quickly and you found yourself nicking it. If a pitch is slow and seams around, you tend not to nick it. At Edgbaston when it happens, it happens quite quickly and that is why you saw guys in the Test who were leaving the ball and edging them because the quickness of the pitch can draw you into a shot. I thought it was a good cricket wicket, but certainly not a 130-odd all-out one. For me, it will be interesting to see what pitch they prepare for the fourth Test at Trent Bridge next week. I have played there when it has seamed all over and we rolled out Notts for 69 and also when there has been one innings per side. You never know what you are going to get at Trent Bridge, but I just hope there’s some pace and bounce in the pitch. I was pleased for Steven Finn at Edgbaston. He’s a real success story as people really wrote him off a few years ago and there was the stuff about him being unselectable. But he’s always had all the attributes and is a natural wicket-taker. Even when he bowls badly, he still gets wickets and he’s bowling good pace at the minute. When you have a guy who is 6ft 6in bowling at 90 mph, he is always going to be tough. As for me, my wrist is a bit sore after injuring it in the recent Championship match. It was lingering around and was starting to affect my batting and it came to a head, so I’ve had an injection. But after missing a few one-day games, I should be okay for Scarborough next week.